I first found out about Felix Martin when Prosthetic Records released The Scenic Album in 2013. What I discovered was an impressive mix of jazz and progressive metal played on a 14-string guitar, and it wasn’t long before I was hooked on what the Venezuelan born musician had to offer. This year Martin and his backing band took to the road for a full run of North American headlining dates, which will include a stop at this year’s SXSW. While the 14-string guitar playing and progressive slant of the music is impressive on record, it seemed like it would have even more of an impact in person. On a fairly cold night the tour made its way to Baltimore with Stinking Lizaveta, Dÿse, and Drewsif Stalin’s Musical Endeavors rounding out the lineup. It was the type of concert where all of the acts had something a little different to offer but fit in perfectly with one another, and those that decided to come out despite the impending threat of snow were able to experience some great performances. Despite the fact that they’re from Baltimore and have been on European festivals (last year’s Euroblast in particular), I hadn’t come across progressive metal band Drewsif Stalin’s Musical Endeavors before. The group started off as a solo project of guitarist/audio engineer Drewsif Stalin before expanding into a full touring lineup. What I’ve heard online is a mixture of progressive metal and death metal with harsher vocals, but the set on this evening was entirely instrumental and seemed focused almost entirely on progressive metal with a little bit of djent thrown in for good measure. I’m not sure if certain members of the band weren’t available for the performance and they decided to play anyway with only instrumentals or what the situation was, but it didn’t hold them back one bit. From a musical standpoint the material was definitely familiar, with the stop/start patterns that are common in this type of music but it was clear that the three instrumentalists on-stage had quite a bit of skill. There were plenty of blistering riffs and Drewsif Stalin’s Musical Endeavors would often start things off with a backing track before launching into their flurry of riffs and drum beats. I sometimes find that this type of progressive metal/djent starts to sound the same after a couple of songs, but that was not the case here and the music kept me engaged throughout the course of the set. It also helped that Drewsif Stalin may have been one of the most animated band leaders I’ve seen recently. He spent quite a bit of time running across the stage, crashing into his bassist on a regular basis. It was clear that all three members were having a blast on-stage, and when they had some slight technical difficulties Stalin announced “We’re going to finish this song horribly out of tune!” and proceeded to not let it phase him at all. I’m curious as to whether they usually have live vocals or not, but whatever the case may be this is another local area band that has my attention. I’ve been following Dÿse since their self-titled album caught my attention back in 2007, and I was pleasantly surprised to see their name pop up on this tour as I wasn’t sure if they were a band I was ever going to get to see live in the U.S. or not. The duo formed in 2003 in the Netherlands but these days call Germany home, and they play a cross between noise rock and math rock that has its own brand of quirkiness. There’s that familiar off-kilter feeling and frenetic, noisier riffs that kick in without warning, but Dÿse has always caught my attention because they’re just a little bit quirkier and sillier than some of the others out there. This aspect of their music translates over perfectly live, as the two members would crack jokes with the audience in between songs and even make up fake song titles on the fly that fit perfectly. One of my favorite elements of the set was how well drummer Jarii van Gohl and guitarist An3 Dietrich play off of each other, as Jarii would sometimes start off songs in slow motion and stretch out the drum hits and An3 would be able to adapt and keep things going. It’s really fun to watch Dÿse perform live, as they are able to pull off the sudden shifts from fast to slow tempos and random bursts of off-kilter vocals or frenetic riffs flawlessly, and both members contribute vocals. I was worried that with four bands on the lineup that they might not have that much time to play, but was happy to find that the set was able to cram in a good deal of material and give the audience the chance to really experience just what their particular style has to offer. Noise rock/math rock doesn’t always tend to lend towards visual performances, as the focus is often on the constantly shifting instrumentation and abrasive edge of the fuzzy grooves, but Dÿse really manages to merge the two sides together. Not only does their instrumentation and screamed vocals grab your attention, but the banter between the two members and the way they play off of each other made me want to focus just as much on watching them perform rather than just taking in the sounds. I hope those who were unfamiliar with the band prior to the show were intrigued by what they heard, as the group definitely deserves a following in the U.S. and I was really excited to finally see them live. Philadephia’s Stinking Lizaveta was the other supporting act, and another group that I hadn’t managed to catch live yet. They’ve been around since 1994 but it wasn’t until 2009’s Sacrifice and Bliss that I became familiar with their particular brand of instrumental rock that has a bit of a jazzier sound to it. That particular record left an impression on me and showcased that this is a band that not only has chops but can keep listeners on their toes with a constant sense of unpredictability. As they took the stage, guitarist Yanni Papadopoulos announced that their entire set would consist of songs that aren’t on their recordings and he wasn’t sure if they would record another full length album going forward. While I do hope that they do release some kind of material again, even if it’s just a track or two, I can’t complain if they continue to play live and come through the area because their live sets are incredible. All three members have a seemingly unlimited amount of energy and are able to blaze through songs that have so many twists and turns that it sometimes feels like you’re lost within their layers of sound. Yanni Papadopoulos and Alexi Papadopoulos play off of each other perfectly, and although there was one moment during the set where they had to restart a song because Alexi couldn’t hear Yanni’s guitar that well on-stage with the monitor setup, this didn’t hurt their set at all and before long they were right back in the middle of their expansive riff work. Drummer Cheshire Augusta deserves quite a bit of credit as well, as she delivers just as much energy with every drum hit and made me want to focus just as much on her playing during the set as the guitar work. Speaking of the guitars, Yanni’s not only a talented player but he caught my attention with some cool tricks like sliding his guitar up against the wall at the edge of the stage to get extra noise out of it. It’s always been a little hard to really pin down Stinking Lizaveta into specific genres, as their brand of instrumental rock seems to take influence from just about every sub-variant you can think of, but if you’re the type of listener that enjoys instrumental material that offers up one twist and turn after the next and makes you forget you’re standing in a crowd of people while you get lost in the sound, seek out their next performance in your area. I had a feeling that seeing Felix Martin play would be a spectacle I wouldn’t forget anytime soon, and this is exactly what happened. As I mentioned earlier, Martin uses a custom built 14-string guitar that acts in a way that makes it seem like he’s playing two guitars at the same time. He’s able to fly up and down the fret board with ease and despite the sheer technical ability that’s present in all of his material, I noticed while watching his set that he makes it look effortless. 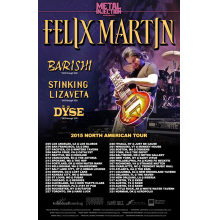 Felix Martin’s music falls somewhere between jazz fusion and progressive metal, but what’s interesting about it is that the songs never truly fall fully into either category. There’s always some surprises during each one, as what might start off as a softer display of jazzier guitar work might suddenly expand into heavier riffs that up the distortion and have much more of a metal influence. Rather than just playing by himself and letting the guitar steal the show the entire time, Martin is backed by two very capable musicians. Bassist Kilian Duarte and drummer Phil Galatioto were not only able to keep up with the arrangements but had plenty of tricks of their own to showcase to the audience, and I was happy to see that they were given opportunity during the performance for some solos. In between each song Martin would talk a little about each one and what some of his influences were when writing them, though the conversation would inevitably circle back to how much of it was a melding of jazz fusion and metal. I liked that there was this interaction with the audience and it did make him seem a bit more personable than some of the other guitar virtuosos out there. I thought before the set that my eyes would be focused entirely on the 14-string guitar and Martin’s playing, but found that I really wanted to see what all three members were doing and this felt more like a proper band playing together than hired guns performing with a solo artist. There’s a lot of potential for crossover appeal with the particular merging of styles that Felix Martin is going for, and I think that fans of jazz fusion and virtuoso guitar playing that might not necessarily orient towards metal could still find themselves appreciating it. The material translates over even better live, as nothing beats the energy that fills the room as all three musicians give it their all and challenge themselves with technical showmanship that continually grabs your attention and leaves you wanting more. Despite the fact that they played for almost an hour it felt like it ended too quickly, and I’ll be eagerly awaiting the next time Felix Martin comes through.